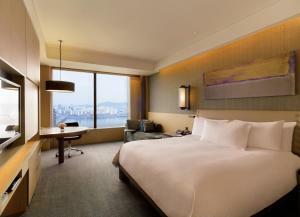 The 434-room Conrad Seoul occupies a prime spot in central Yeouido, the city’s banking and financial services center. This part of town—which is actually an island on the Han River—does not get much respect among tourists and people outside the banking sector, but we love the hotel enough to suggest it as a great base for exploring Seoul. With the city’s expansive transportation network, you can reach tourist areas easily, and (importantly) you are on an express stop for the subway line to Gimpo International Airport (which has easier access to the city than Incheon). So why would we suggest you stay in a financial center on an island not necessarily close to the cultural and tourist attractions of Seoul? Well, the rooms at Conrad Seoul are close to the best in the city. At 48sqm, entry-level rooms here are larger and, dare we say, on par with those at the far pricier Park Hyatt across town. Rooms here are also a little more high-tech and high-touch, with 46in LCD TVs, a Bose radio, Nespresso machines and a comfy sofa perched next to the wide windows overlooking the city and river. Conrad Seoul bests the Park Hyatt in terms of facilities, offering a 25m indoor pool framed by large windows and a fitness center that has enough running machines and ellipticals for a small army to train together. This is a big hotel, so check-ins can be busy and waiting lines for the breakfast buffet can be long. And, shockingly, WiFi is not free, which is a sin for hotels today (Hilton Group, if you are reading this, please reconsider!). Dining options are very good at Conrad Seoul, especially the high-end 37 Grill and Bar, which serves up some the best steaks in town and has a large wine list. Seoul's best indoor hotel pool? Don’t make the mistake of taking a taxi at busy times to reach points outside of Yeouido, unless you like sitting in traffic. Use the subway network—it’s one of the best in Asia. This is one of the best Conrads in Asia, or anywhere for that matter. An important criteria for inclusion on The List, is the frequency with which our friends in the hotel and travel industry recommend a hotel in a certain city. Conrad Seoul is continuously at the top of this "go-to" list.